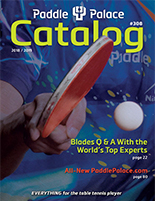 The Azalea Offensive blades draw from the culture and history of Japanese Table Tennis. Developed in close collaboration with Japanese female players in search of the perfectly balanced Offensive blade, the focus is on light weight and outstanding feeling and control. Like all Stiga blades, the Azalea Offensive is built with a harder second layer compared to the Azalea Allround, which increases the power and speed of the blade. This is a well-balanced blade that inspires confidence. It feels light and quick, has a subtle touch on the ball, and can produce a surprising amount of power when the harder second layer is engaged. A beautiful blade for both women and men.